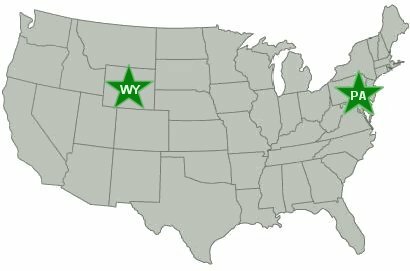 Find immediate answers to your specific piano restoration questions for Wyoming. As pianos grow old the strings eventually become brittle. This is a natural process that comes with age. It's not a sign of a bad piano or bad string. They simply wear out. Complete piano restoration includes restringing with a new set of strings. Plus, your pin block will be repaired, rebuilt or replaced to keep the strings tight and in tune. The soundboard and bridge will be repaired or rebuilt to bring out the beautiful sound of the new strings. Everything should look beautiful and the sound should be exquisite. At our shop we make sure of this. The treble strings of a piano are made of steel wire. What makes the different notes is the length of the wire. The notes at the top of the piano's range have much shorter lengths of piano wire than do the notes down by middle C.
The bass strings are wrapped with copper coil. This makes them heavier. Sometimes the lower end of the tenor section will use wound strings to make the transition from low treble to bass nice and smooth. A new set of piano strings is a fortunate aspect of a complete piano restoration service package. The University of Wyoming offers degrees in music including Bachelor of Arts (with Music Major), Bachelor of Music, emphasis in instrumental, vocal, or piano and other keyboard performance, Bachelor of Music Education (teaching in elementary or secondary schools), Minor in Music. There are also graduate degree programs including Master of Music in performance, Master of Arts in Music Education for music educators.